The Nikon NE-100 10-Second Theodolite offers exceptional viewing quality and precise angle measurements for general construction and survey applications. Integrated with an ergonomic keypad, large display and reticle illuminator, this durable optical instrument has a minimal learning curve and provides bright views in any light condition. With 10-second accuracy, this surveying instrument delivers precise vertical and horizontal angle measurements. This electronic theodolite enables a number of positioning techniques, such as 90-degree layout, alignment and plumb, short-range grade work and leveling. Superior Nikon telescope with 30x magnification provides a clear view of the target from any distance. The NE-100 also has a built-in optical plummet and detachable tribrach for fast and convenient setup. Featuring five one-touch keys, this Nikon theodolite performs all common functions and gives surveyors control over the backlit LCD display and reticle illumination. You can instantly convert vertical angles to percent of grade, reset the horizontal angle to zero and lock the horizontal angle displayed on the LCD while repositioning or repeating a measurement. The NE100 theodolite has a built-in reticle illuminator and backlit LCD display that allows construction professionals to work inside buildings as well as in tunnels, mines, and other environments with little or no light. These features also come in handy during low-light conditions outdoors, such as near dawn or dusk. Even if you work in dust and water, the Nikon NE-100 performs well in rugged environments with its IP-54 rating. It has a 22-hour operating time using manganese batteries and works up to 48 hours using six alkaline batteries. A three-level bar graph on the LCD screen displays remaining battery power. 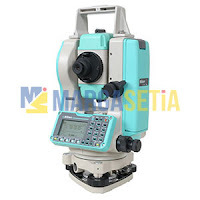 This Nikon theodolite package comes with a hard carrying case, adjustment pin, hexagonal key, objective cap, dust cover, plumb bob, AA batteries and 2-year manufacturer’s warranty.